"Isolated Danger Marks" are found in both IALA Regions “A” and “B” and are used to mark small, isolated dangers where navigable water will be found in all directions around the marked danger. 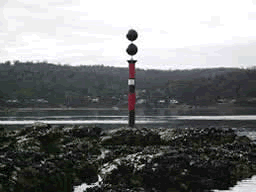 These marks, beacons or buoys, mark dangers such as shoals and rocks, and are also frequently used to mark wrecks. Basically, any small and isolated hazard which poses a danger to surface navigation. All Isolated Danger Marks are black with one or more red bands. The most important feature is the topmark which consists of (2) round balls (or spheres,) aligned vertically one above the other. Where practical, the topmarks will be carried with the spheres as large as possible and clearly separated. Will only show a white light. Will always be Flashing (2) – Fl (2). 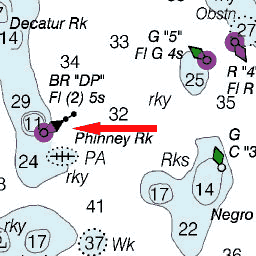 The chart notation is: Black and Red Buoy, marked "DP", showing a flashing (2), white light, with a period of 5 seconds. 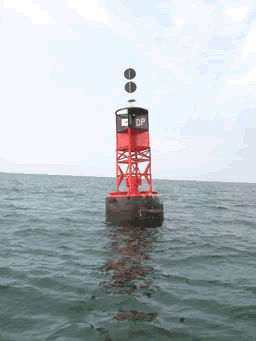 It also clearly shows the double sphere topmark to aid in its identification as an Isolated Danger Buoy. Isolated Danger Marks are the same regardless if you are in IALA Region A or Region B. Are always colored black with red horizontal band/s. Always use double spheres for their topmark. Only show a flashing (2) white light if a lighted aid. Will have safe water in all directions surrounding it. To be safe, marine interests should remain well clear of an isolated danger mark.